Today is the 50th anniversary of the University of Utah Seismograph Stations, which now include 237 seismic-recording stations located in Utah, Wyoming and Idaho to monitor earthquakes throughout the world and the region, including Yellowstone and Grand Teton national parks. The U’s Department of Geology and Geophysics commemorated the anniversary and the Seismograph Stations’ founding director, the late Kenneth L. Cook, last Friday with a program and tours. 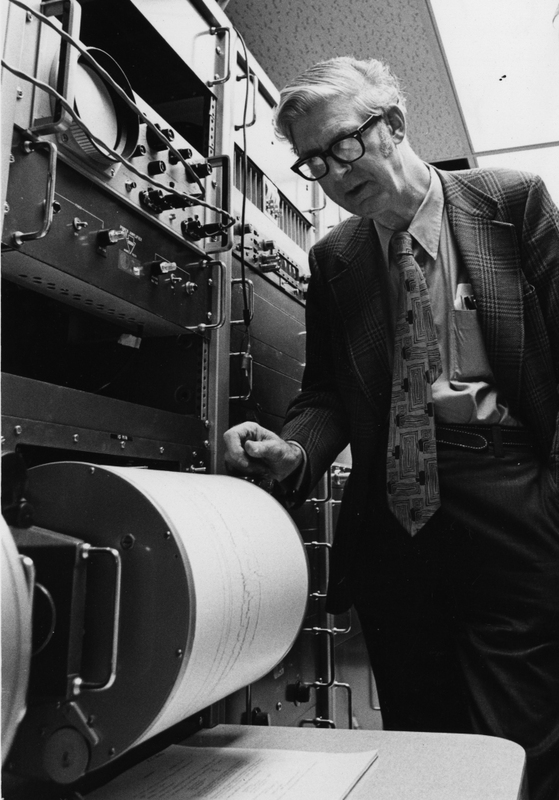 Kenneth L. Cook was named first director when the U’s governing board established the University of Utah Seismograph Station on April 11, 1966. The first seismographs to record earthquakes were installed on campus in 1907 by geology professor and former U president James E. Talmage. In 1952, Cook joined the U as a geophysics professor, headed and expanded what was then the Department of Geophysics, assumed responsibility for earthquake-recording on campus and ultimately became known as the Father of Utah Geophysics. When formally established in 1966 with Cook as its first director, the Seismograph Stations ran three stations in Salt Lake City, Dugway and Price. A station in Cedar City was added later. Utah State University sent paper seismograms from Logan. Utah’s then-Gov. Calvin Rampton began state funding of the Seismograph Stations in 1971 and helped make it a line-item legislative appropriation in 1972. A major transformation of the seismic network began in 1974: On-site seismic recordings were replaced gradually by a network of seismometers placed in the field that transmitted and their data by radio, telephone or microwave. By the end of 1975, there were 27 telemetered stations covering much of the Wasatch Front. At the end of the 1970s, there were nearly 60 stations. Cook ran the Seismograph Stations until 1976, retired in 1981 but remained active as professor emeritus until his death in 1996. The stations subsequently have been directed by Stan Ward (1976-1980), Robert B. Smith (1980-1985), Walter Arabasz (1985-2010) and Keith Koper (2010-present). Smith expanded the network to include and then enlarge a U.S. Geological Survey-installed network in the Yellowstone-Teton region. Arabasz helped get federal and state funds to further modernize the network and expand it statewide in Utah. Ahead of the 2002 Winter Olympics in Salt Lake City, Arabasz also started a real-time quake-information system. In 2009, the Seismograph Stations moved from its seventh-floor offices in the Browning Building into seismically hardened, state-of-the-art facilities in the Rio Tinto Earthquake Information Center in the new Frederick Albert Sutton Building. The aims of the Seismograph Stations are to improve earthquake safety throughout the region, educate new generations of seismologists and conduct cutting-edge research. A more detailed history of the Seismograph Stations is available here. Lee J. Siegel is a senior science writer at University Marketing and Communications. If you have an interesting story idea, email him at lee.siegel@utah.edu.